How does IB-Matlab compare to alternative products? 3. Supported IB API subset 100% – full support, including account info, portfolio data, market snapshots, market depth, scanner data, streaming quotes, realtime bars, historical/intra-day data, option chains, contract details, managing open orders, sending trade orders, executions tracking, event callbacks, connection configurations. Only a small subset of the IB API. For example, the following are not supported: account data, current portfolio, streaming quotes, realtime bars, scanner data, options chain, contract details, bracket and combo orders, options exercise/lapse, hedging, managing open orders. 4. Configurability Numerous features and functionality configurations. The default configuration enables easy out-of-the-box usage, while dozens of parameters can be modified from their default values for specific securities, exchanges, contract types, order types etc. Only limited configurability or requires difficult dedicated programming. 5. Usability Easy-to-use Matlab wrapper function with numerous settable parameters, in addition to providing direct access to the raw API connector object. Very simple-to-use interface, accessed via a single function (IBMatlab) having consistent parameters that have sensible default values and can be specified in any order. Only provide the raw connector option, which is much more difficult to program and debug. Numerous functions having various parameters that must be specified in a specific order and data type. Also available: short-term, multi-year, academic, volume (multi-computer), site-wide, deployment, OEM and source-code licenses (detailed list) Alternative commercial licenses cost much more. You can directly connect to IB’s API connector for free, but this would require hundreds of development work-hours in order to get corresponding functionality. No other solution provides such a rich set of features and excellent value as IB-Matlab – not even close. Note: if you get an error "Server creation failed. 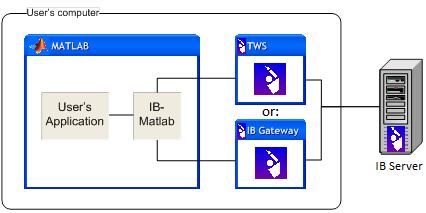 Invalid ProgID 'TWS.TwsCtrl.1' ", this is a direct result of using the Trading Toolbox’s ActiveX connector to IB/TWS, which only works on some combinations of Matlab and IB/TWS releases. Give IB-Matlab a free trial and see that it works out-of-the-box, without any fuss or error, on ALL combinations of Matlab and IB/TWS. These quotes are from real IB traders, who took the time to comment anonymously about IB-Matlab on IB’s website using IB’s system. 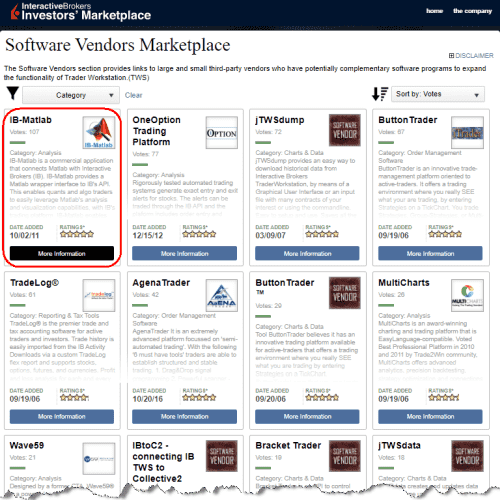 Over 100 traders have anonymously rated IB-Matlab on IB’s website – all of them, without exception, rated IB-Matlab with a perfect 5-star rating. Such perfect rating and superlatives from so many independent traders is unparalleled by any other program on the IB Marketplace. Don’t take our word for it – request a fully-functional free trial version, and check for yourself! You will not be disappointed.